Our Training IN Counseling aims to train people skilled in human relations management; men and women with particular sensitivity, equipped with good intuition and wisdom; people with superior awareness and emotional intelligence and a strong sense of individual and social responsibility. Experiments of presence, listening, contact. on the premises of "Lo Specchio Magico", via Giuseppe Genè 12, Turin, at the ASAI School "Beyond School". "My presence is my state of awareness, it is my capture, with all my senses, what is happening inside and outside of me. Presence is the result of listening, of the attention I reserve to my "feeling". My abilities of listening, of attention, of welcome develop my awareness; my "being" in and with my states of awareness qualify my presence, my "being there" in / in the "here and now" of my life. In turn, my being present develops my capacity for listening, for attention, for welcoming; experiencing it develops my awareness, in a virtuous circle whose elements feed each other. Presence is the precondition of contact with the other and with the environment and it is what allows me, when this contact takes place, to meet and discover those parts of myself that are still unknown. My presence has to do with my ability to be with "what is", listening to it in the "here and now" of the experience, outside and inside of me. The contact with myself, with all the parts and the requests that constitute me, determines my state of presence, which, in turn, presides over my contact with others and with the environment, which is, always, a function of my listening. The quality of the presence of those in an interpersonal relationship is what determines the quality of the contact that is able to establish. In this sense, knowing how to be present is an essential skill for the quality of a relationship. 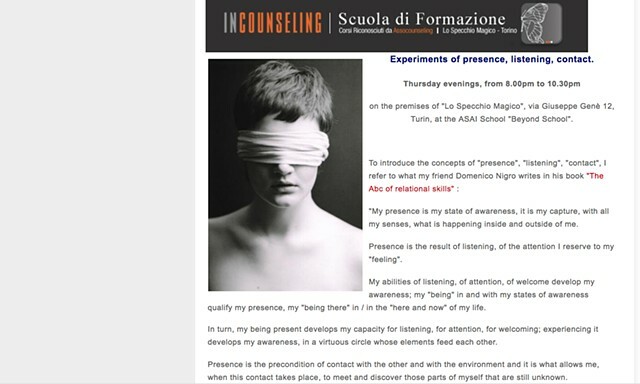 Presence results from contact with the self and is the "conditio sine qua non" of contact with the other and with the environment. Keeping in touch safeguards us from being manipulated and from unlawfully manipulating others and the environment, safeguards us from pouring our responsibilities and our "miseries" onto others and our environment and, in this sense, makes us trustworthy in terms of relationships and makes our perceptions and intuitions reliable (first of all for ourselves) ... "
Participating in my "Experiments" helps you feel better about yourself and others.